Almost twice as many women as men consider it “very important” that their future spouse have a “steady job”. … Never-married women place a great deal of importance on finding someone who has a steady job—fully 78% say this would be very important to them in choosing a spouse or partner. For never-married men, someone who shares their ideas about raising children is more important in choosing a spouse than someone who has a steady job. Could it be that women still think they’d like to stop working when they have children? Yes. One recent survey found that 84% of working women want to stay home to raise their children. Wendy Wang and Kim Parker, “Record Share of Americans Have Never Married”, Pew Social Trends, September 24, 2014. Female college students seem to value good grades over high salaries. This premise lead Catherine Rampell to advise women to “embrace the B’s in college to make more later”. A message to the nation’s women: Stop trying to be straight-A students. No, not because you might intimidate easily emasculated future husbands. Because, by focusing so much on grades, you might be limiting your earning and learning potential. The college majors that tend to lead to the most profitable professions are also the stingiest about awarding A’s. Science departments grade, on a four-point scale, an average of 0.4 points lower than humanities departments, according to a 2010 analysis of national grading data by Stuart Rojstaczer and Christopher Healy. And two new research studies suggest that women might be abandoning these lucrative disciplines precisely because they’re terrified of getting B’s. Slipping grades seem to discourage women from pursuing their chosen careers while men were not similarly deterred. Claudia Goldin, an economics professor at Harvard, has been examining why so few women major in her field. The majority of new college grads are female, yet women receive only 29 percent of bachelor’s degrees in economics each year. Goldin looked at how grades awarded in an introductory economics class affected the chance that a student would ultimately major in the subject. She found that the likelihood a woman would major in economics dropped steadily as her grade fell: Women who received a B in Econ 101, for example, were about half as likely as women who received A’s to stick with the discipline. The same discouragement gradient didn’t exist for men. Of Econ 101 students, men who received A’s were about equally as likely as men who received B’s to concentrate in the dismal science. Another research project, led by Peter Arcidiacono at Duke University, is finding similar trends in science, technology, engineering and mathematics. Other research confirms that perfectionism holds women back in the workplace. … The perils of feminine self-doubt — and how they impact women’s professional aspirations — are the subject of a new book, The Confidence Code, by journalists (and recovering self-doubters) Katty Kay and Claire Shipman. Jessica Bennett, “It’s Not You, It’s Science: How Perfectionism Holds Women Back”, Time, April 22, 2014. Girls have been using their brains to better effect than boys for years when it comes to exams and they are now doing the same to increase their status in street gangs according to new research. While young men are content to hang around estates and town centres smoking drugs, girls are taking full advantage of their superior social skills in helping them climb the criminal ladder as they are increasingly relied on for money laundering, smuggling weapons in their prams or hiding drug stashes. Dr. Simon Harding from Middlesex University in London reported his conclusions after spending four years studying gang members aged 16-25. This finding is not surprising, considering that other research has shown teenage “boys lag behind girls in developing ‘critical social skills’“. Paul Gallagher, “Girls’ brains help them do better at exams – and at gang crime – scientists say”, The Independent, April 25, 2014. “Social skills make women better criminals”, The Telegraph, April 25, 2014. According to a six-year Dutch study, teenage boys are slower to develop two social skills. In adolescence, critical social skills that are needed to feel concern for other people and understand how they think are undergoing major changes. Adolescence has long been known as prime time for developing cognitive skills for self-control, or executive function. “Cognitive empathy,” or the mental ability to take others’ perspective, begins rising steadily in girls at age 13, according to a six-year study published recently in Developmental Psychology. But boys don’t begin until age 15 to show gains in perspective-taking, which helps in problem-solving and avoiding conflict. Adolescent males actually show a temporary decline, between ages 13 and 16, in a related skill—affective empathy, or the ability to recognize and respond to others’ feelings, according to the study, co-authored by Jolien van der Graaff, a doctoral candidate in the Research Centre Adolescent Development at Utrecht University in the Netherlands. Fortunately, the boys’ sensitivity recovers in the late teens. Girls’ affective empathy remains relatively high and stable through adolescence. Affective and cognitive empathy are valuable skills in the school setting, and these gender differences could help explain why boys “score as well as or better than girls on most standardized tests, yet they are far less likely to get good grades, take advanced classes or attend college”. Testosterone and social pressure may both be determining factors. How much do fathers matter? Fathers seem to play a special role. Teens whose fathers are supportive, who say they feel better after talking over their worries with their dads, are more skilled at perspective-taking, says a 2011 study of 15- to 18-year-old boys in Developmental Psychology. Ambiguous terminology in the use of “cognitive” and “noncognitive” can be confusing. The term”noncognitive” seems to vary in meaning depending on context. Daniel Willingham helps explain how it is sometimes used as shorthand for what many people consider “non-academic” skills. “Non-cognitive factors” is a misleading but entrenched catch-all term for factors such as motivation, grit, self-regulation, social skills. . . in short, mental constructs that we think contribute to student success, but that don’t contribute directly to the sorts of academic outcomes we measure, in the way that, say, vocabulary or working memory do. Boys can try to catch up to girls. I keep hearing that boys tend to shape up and mature after freshman year in high school. That has not been my observation, but even if they do this just means they have to catch up to girls in a few short years or else suffer long-term consequences from getting off track in their early teen years. Sue Shellenbarger, “Teens Are Still Developing Empathy Skills”, Wall Street Journal, Oct. 15, 2013. As a way to close this gender salary gap, Harvard Business School set out to give “itself a gender makeover, changing its curriculum, rules and social rituals to foster female success“. It is an ambitious plan, intended “to change how students spoke, studied and socialized”. But in 2010, Drew Gilpin Faust, Harvard’s first female president, appointed a new dean who pledged to do far more than his predecessors to remake gender relations at the business school. He and his team tried to change how students spoke, studied and socialized…. Am I the only one who thinks this sounds a little creepy? … The school saw itself as the standard-bearer for American business. Turning around its record on women, the new administrators assured themselves, could have an untold impact at other business schools, at companies populated by Harvard alumni and in the Fortune 500, where only 21 chief executives are women. The institution would become a laboratory for studying how women speak in group settings, the links between romantic relationships and professional status, and the use of everyday measurement tools to reduce bias. 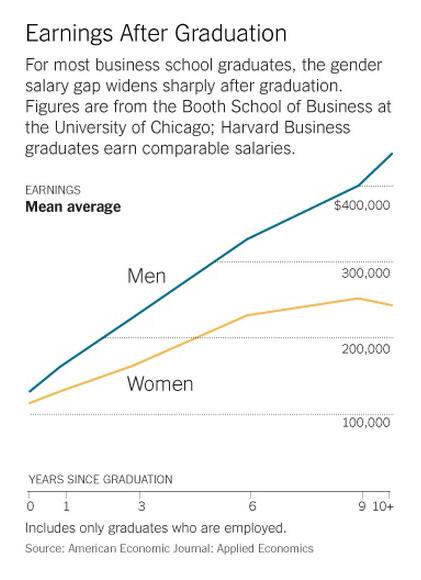 Many of us are familiar with the gender wage gap, including the part about women often feeling they have “to choose between academic and social success” and that business schools see their graduates “part by gender after graduation, with more men going into higher-paying areas like finance and more women going into lower-paying ones like marketing”. But I didn’t realize that a typical HBS female student had to “be taught how to raise her hand”. Who knew that these best and brightest examples of high-achieving women were such wallflowers? Apparently they need coaching on how to participate effectively in classes where men tend to take over discussions. Marianne Bertrand from the Chicago Booth School of Business recently gave a presentation that included a list of “documented robust gender differences in a set of psychological attributes”. Even if the environment can be modified to promote more women into corporate leadership roles, Bertrand points out that policy responses will only be effective if we can confirm that these are learned behaviors. Author and journalist Harry Mount responds to the professors of education who oppose Britain’s new national curriculum. They claim it will ‘will place an overemphasis on memorising “endless lists of spelling, facts and rules”’, thereby robbing ‘children of the “ability to think”‘. Those academics think knowledge and thought are at war with each other in a zero-sum game; that you can’t have one without destroying the other. They say that rote learning is less important than “cognitive development, critical understanding and creativity”. How wrong they are – and how depressingly keen on the dreary, Latinate jargon of academese. You can’t be critical or creative, or develop, without knowing anything. Knowledge and thought aren’t chickens and eggs: knowledge always comes before a decent thought. Brilliant thinkers invariably know lots of things; and people who don’t know anything are usually stupid, unless they have had the cruel misfortune to have their natural intelligence stunted by an education system that prizes ignorance. Daniel Willingham would further argue that we need “inflexible” knowledge , which is “memorizing with meaning”. Rote knowledge, which is memorizing without meaning, is typically a precursor to flexible knowledge. Girls get more reading time with their parents than boys do. One theory holds that girls might have a greater inclination toward such activities. (Theories suggesting innate differences between boys and girls and between men and women are hotly debated.) Another theory is that parents may be following cultural scripts and unconscious biases that suggest they should read with their daughters, and have active play with sons. It is also possible, Baker says, that the costs of investing in cognitive activities is different when it comes to boys and girls. As an economist, he isn’t referring to cost in the sense of cash; he means cost in the sense of effort. Check out a new blog. My son recently launched a new blog. Occam’s Razor Scooter “is dedicated to news, pop culture, sports, and whatever else the author finds interesting”. Politics is a particular focus, with a regularly updated guide to next year’s US Senate elections. And the blog’s “dog of the day” feature is worth checking just for a daily smile. Women are catching up to men. PORTSMOUTH, Ohio — Prescription pain pill addiction was originally seen as a man’s problem, a national epidemic that began among workers doing backbreaking labor in the coal mines and factories of Appalachia. But a new analysis of federal data has found that deaths in recent years have been rising far faster among women, quintupling since 1999. More women now die of overdoses from pain pills like OxyContin than from cervical cancer or homicide. And though more men are dying, women are catching up, according to the analysis by the Centers for Disease Control and Prevention. And the problem is hitting white women harder than black women, and older women harder than younger ones. In this Ohio River town on the edge of Appalachia, women blamed the changing nature of American society. The rise of the single-parent household has thrust immense responsibility on women, who are not only mothers, but also, in many cases, primary breadwinners. Some who described feeling overwhelmed by their responsibilities said they craved the numbness that drugs bring. Others said highs made them feel pretty, strong and productive, a welcome respite from the chaos of their lives…. Women are more likely to rely on prescription pain medicine. Deaths among women have been rising for some time, but Dr. Thomas R. Frieden, the C.D.C. director, said the problem had gone virtually unrecognized. The study offered several theories for the increase. Women are more likely than men to be prescribed pain drugs, to use them chronically, and to get prescriptions for higher doses. The study’s authors hypothesized that it might be because the most common forms of chronic pain, like fibromyalgia, are more common in women. A woman typically also has less body mass than a man, making it easier to overdose. Women are also more likely to be given prescriptions of psychotherapeutic drugs, like antidepressants and antianxiety medications, Dr. Volkow said. That is significant because people who overdose are much more likely to have been taking a combination of those drugs and pain medication. Broader social trends, like unemployment, an increase in single-parent families, and their associated stressors, might have also contributed to the increase in abuse, but they are slow moving and unlikely to be a direct explanation, Dr. Volkow said. Over-regulation is making America poorer. Macroeconomists typically divide government economic activity into four broad classes: spending, taxation, deficits, and monetary policy. There is, however, a fifth class of activity that may well have important effects on economic activity but that nevertheless has received little attention in the macroeconomic literature: regulation. Although microeconomists have analyzed both the causes and effects of regulation for decades, macroeconomists have joined the discussion only much more recently, with a number of empirical studies suggesting that regulation has significant macroeconomic effects. Economist Mark J. Perry thinks this study actually under-estimates the total cost of regulation since it does not include “wasteful rent-seeking that private firms engage in before the regulations are in place, as they attempt to influence (support, oppose or change) federal regulations when they are first being proposed and considered”. State and local regulations are also excluded. … Adding in these costs of rent-seeking, and the costs of state regulations, paints a pretty depressing picture of how much poorer we all are due to the crushing burden of government regulations. Patience may be an undervalued 21st century skill. According to Daniel Willingham, the problem of students’ declining attention span is less about technology changing the brain, and more about never having to face boredom. Today’s kids are rarely forced to be bored. Jennifer Roberts, a professor of the History of Art and Architecture at Harvard, suggests an exercise in which students are asked to study a painting for three hours. While this seems excessive, this long duration of simple observation causes the students to see features about the painting that they would never have noticed if they had given up after a few minutes. … The goal is that the student think “Okay, I’ve seen about all I’m going to see in this painting.” But because they must continue looking, they see more. And more. And more. Patience is rewarded. Digital dementia is characterized as the deterioration of brain function as a result of the overuse of digital technology, such as computers, smart phones and Internet use in general, Medical Daily reported. This excess use of technology leads to unbalanced brain development, as heavy users are more likely to overdevelop their left brains, leaving their right brains underdeveloped…. Common symptoms of digital dementia include memory problems, shortened attention spans and emotional flattening. According to experts, this disorder has become a significant problem in South Korea, which is home to the world’s largest population of Internet users. The World Bank found that 83.8 percent of South Koreans have Internet access, and The Wall Street Journal estimated that 85 percent of the country’s population will have smartphones by 2017. (MoneyWatch) One out of every five adults 20 years of age or older owe money on student loans, and more than half of them are worried about this debt, according to a new study by the Urban Institute. The exact figures for American adults: 19.6 percent have student loans and 57 percent are concerned about repayment. A third of the debtors are not college graduates, and 9 percent of them possess only a high school degree. The high school graduates may have incurred debt by pursuing nondegree training or helping to pay for a child’s education. Some 25 percent attended college but did not graduate. Women are no more likely to incur college debt than men, but they are 8 percent more prone to worry about it…. ‘College graduation rates in the United States are continuing to slip behind’ those of other countries. College graduation rates in the United States are continuing to slip behind, according to a report published on Tuesday by the Organization for Economic Cooperation and Development, failing to keep pace with other advanced nations. In 2000, 38 percent of Americans age 25 to 34 had a degree from a community college or a four-year institution, putting the nation in fourth place among its peers in the O.E.C.D. By 2011, the graduation rate had inched up to 43 percent, but the nation’s ranking had slipped to 11th place. Why are women with more options turning away from STEM careers? Are they being steered away from these careers, or are they making choices based on their own interests? Electronic portfolios are becoming more accepted by employers. achieve promotion, and much more. Some universities host e-portfolios for their students, or other sites and resources can be used. Clemson University has an ePortfolio Program with a gallery of examples. In a ‘post-union era’, Wisconsin aims to reward ‘hard-working, high-achieving, and outstanding’ state employees. After the “virtual elimination of collective bargaining and automatic dues collections” invalidated union contracts for Wisconsin state employees, the compensation system has changed from one that mandated automatic pay raises for all employees. Under the discretionary merit pay program, fewer employees received raises compared to the old collective bargaining agreement; the average raise was more money.